I need to get back into my workouts. I spent some time just slacking off. I forgot to go to the gym, let myself be distracted by my friends, and started eyeing the cookies at the grocery store with much less restraint than before. What I’ve determined is that I wasn’t putting more time into making satisfying meals that would hold me over from lunch until dinner time. If a tummy is full, then there is no need to try to satisfy it with sugary snacks. 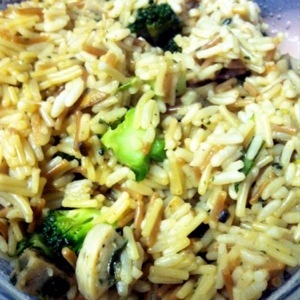 So I aimed to make a rice dish that I could take to work if I pre-made it. 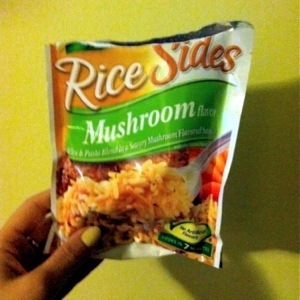 It all starts with a short cut – mushroom rice. Why not take a shortcut? 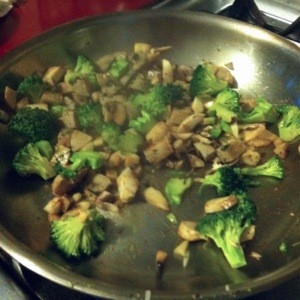 As the rice cooked, in a separate pan I sauteed a little more than a cup of chopped broccoli (including the stems chopped), a quarter cup of diced mushrooms, one link of pre-cooked spinach chicken sausage, and olive oil. I cooked that for about 8 minutes, or until the sausage was getting a golden color and the broccoli was still hard, but heated through. That entire mixture was folded into the (by now) finished rice. It stays well for another day, so if made the night before, it’s perfect for a take to work lunch. If you portion it out, it’t fairly low calorie, too!